4 hour Back Back Fishing Charter. Our back bay guides fish in the famous Charlotte Harbor Aquatic Preserve - the 2nd largest estuary in the state of Florida and 17th largest in the nation! There are over 200 square miles of fishable water in the harbor with a variety of fish available including snook, redfish, trout, cobia, snapper, mackerel, tarpon and shark. Our back bay boats generally fish in shallow water with light spinning tackle and live bait. We ask passengers to arrive 15 minutes before your scheduled charter time. Wear weather appropriate clothes and closed toed shoes. Bring personal items such as hats, cameras, sunscreen, food and drinks. 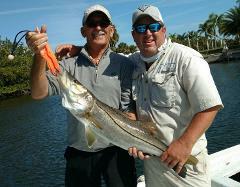 We provide everything needed for fishing including captain, rods, tackle, bait, licensing and fish cleaning service. Small coolers are welcome on board. 6 hour Back Back Fishing Charter. 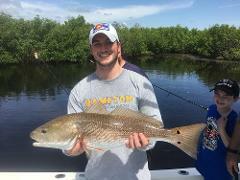 Our back bay guides fish in the famous Charlotte Harbor Aquatic Preserve - the 2nd largest estuary in the state of Florida and 17th largest in the nation! There are over 200 square miles of fishable water in the harbor with a variety of fish available including snook, redfish, trout, cobia, snapper, mackerel, tarpon and shark. 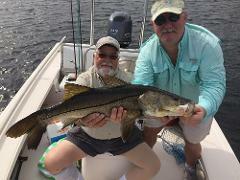 Our back bay boats generally fish in shallow water with light spinning tackle and live bait. 8 hour Back Back Fishing Charter. Our back bay guides fish in the famous Charlotte Harbor Aquatic Preserve - the 2nd largest estuary in the state of Florida and 17th largest in the nation! There are over 200 square miles of fishable water in the harbor with a variety of fish available including snook, redfish, trout, cobia, snapper, mackerel, tarpon and shark. Our back bay boats generally fish in shallow water with light spinning tackle and live bait. 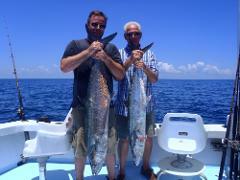 Our deep sea charter guides fish in the Gulf of Mexico off Southwest Florida. Gulf waters are home to more than a hundred species of saltwater fish including grouper, snapper, shark, barracuda, kingfish, and mackerel. Our deep sea boats run full day trips in the Gulf, from 8:00 am to 5:00 pm, carrying up to six anglers in comfort and safety. We ask passengers to arrive at 7:45 a.m., which is 15 minutes before your scheduled charter time. Wear weather appropriate clothes and closed toed shoes. Bring personal items such as hats, cameras, sunscreen, food and drinks. We provide everything needed for fishing including captain, mate, rods, tackle, bait, licensing and fish cleaning service. Coolers are welcome on board. This option is not available for booking online. Call 941-639-0969 to book.